I remember the grand opening of MOCAK very well. That was the day when dreams came true and an ambitious goal was finally achieved. 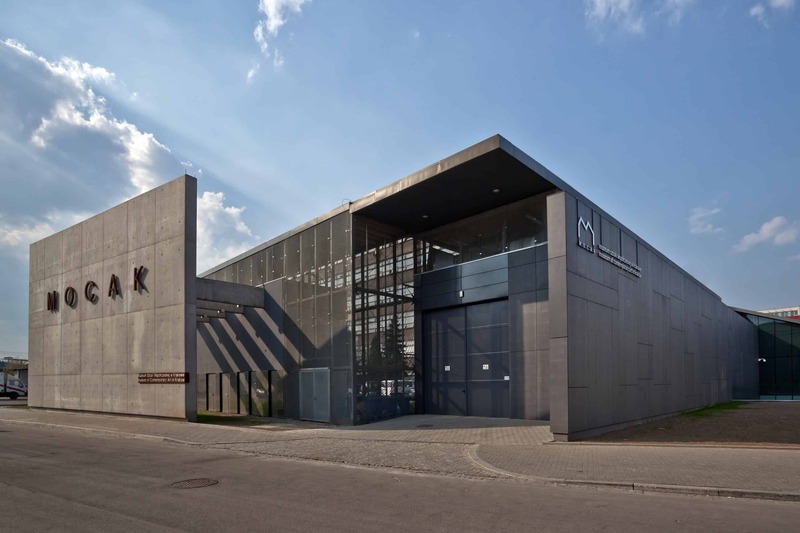 The President of the Republic of Poland, Bronisław Komorowski, and the President of Krakow, Jacek Majchrowski opened the museum. The fact that such prominent figures had honoured us with their presence on this big day meant a lot to us because it signified the important role that our institution was about to play on the Polish art scene. I remember being exhausted, but, strangely, I felt fresh and enlivened at the same time. I will never forget this combination of contradictory feelings which were stirred up inside me. Nicolas Chamfort once said that every human being needs to find and engage in a chosen activity, but that that activity should never be degraded to become this person’s work. I must admit his statement accurately describes what my occupation means to me. I rarely have the feeling that I am doing my job in order to earn a living, since I am so fascinated with what I do. Now, try to imagine how pleasant it is for me to get a salary every month. This practically doubles the excitement. From the point of view of architecture, my office is really interesting and unconventional. It also has a very high ceiling. 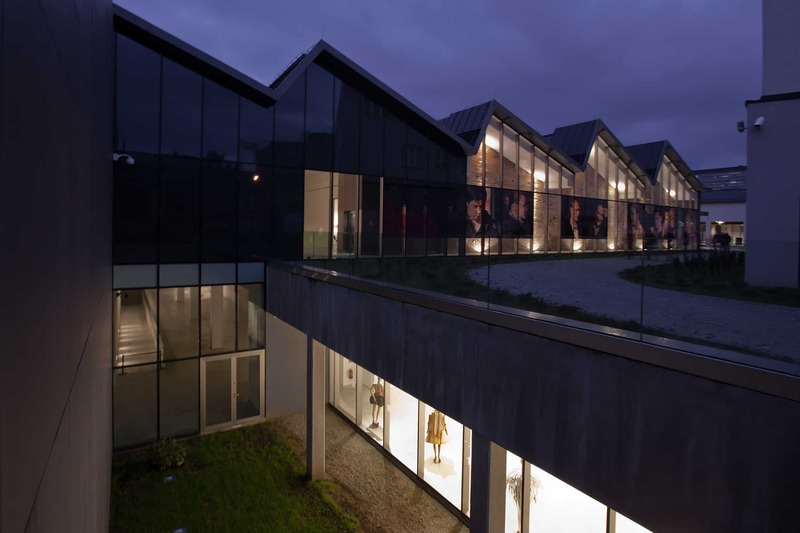 It is situated in the side building of the former Schindler’s Factory and is actually a part of the original shop floor. The architectural detail which reminds me of the site’s past is the enormous skylight, which defines the shape of the whole room. 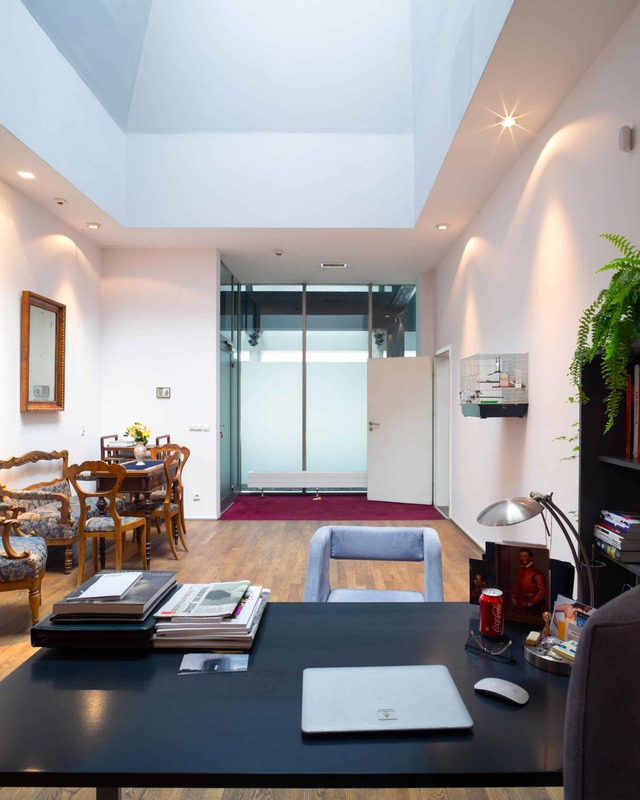 The office is divided into two parts, namely a small sitting room, where we meet our guests, and the office part with a small library. The library features all the MOCAK publications, i.e., an impressive collection of over 120 printed pieces. 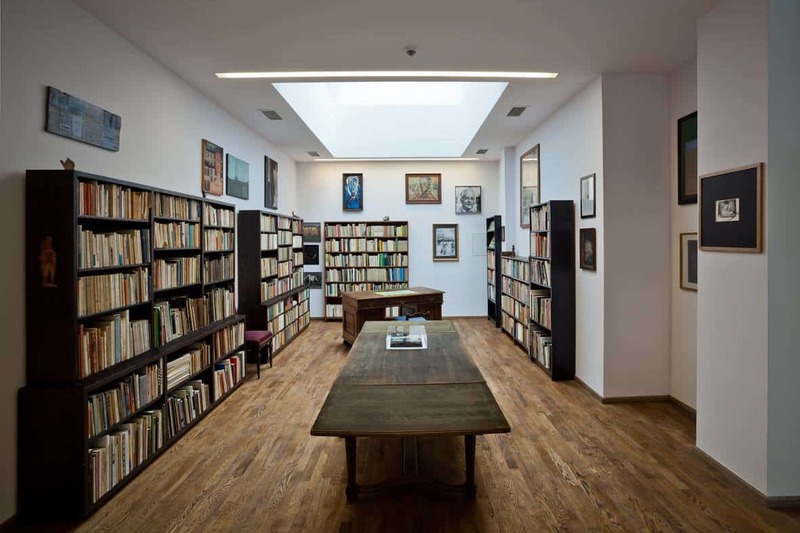 From 2002 until 2010 I was the director of the Bunkier Sztuki Gallery of Contemporary Art, so the publications issued by that gallery are also an important part of my present library. On another shelf, I have placed books related to the projects we are currently working on. At the very top of the bookshelves, I have put pot plants – their stems and leaves cascading down like a green waterfall. There are also two sculptures on the bookshelves – the ironic Madonna by Piotr Blamowski and an 18th-century angel with golden wings. The office walls feature paintings by Kamil Kukla, Jerzy Nowosielski, Marian Eile, Edward Dwurnik and Wilhelm Sasnal. Opposite the entrance, you will see two paintings by Jan Matejko – the father of Krakow art. I always get up relatively early, check my e-mail and the weather forecast. I also browse the latest news, hoping to spot indications of any impending political changes. Afterwards, I start writing. This is how I define myself: I am a writer. I provide a lot of input for our museum’s publications. Of course, I don’t get paid for my articles. At about 10 am I arrive at MOCAK. I start by having a coffee with the deputy director. We manage the museum together and are equals when it comes to our rights and obligations. We have divided the management activities between us, with each of us responsible for some of them. We discuss all the crucial issues, share our problems and concerns and try to find the best solution. After the morning chat, we each go to our respective offices. Every day when I come into my office, I am amazed – I have to remind myself that I am the director here. I think this realisation will continue to surprise for as long as I continue at MOCAK. Nevertheless, I am quite aware that this is not all about my authority and position but rather about duty and commitment. 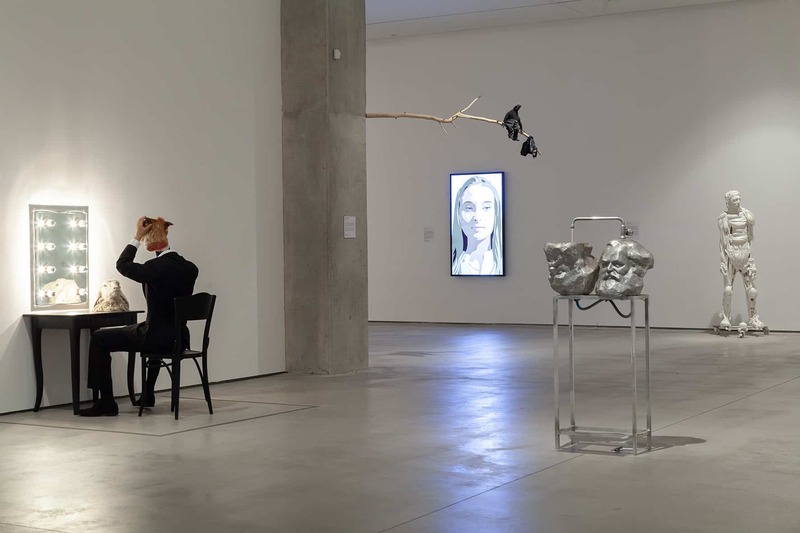 The primary task of a museum director is to find an answer to the question “What is the point of our existence?” There are several possible answers to this question, but when you think about MOCAK, only one of them seems right. Some art institutions claim that their role is to make artists happy. Others become a battlefield for curators, with survival of the fittest the order of the day. I wouldn’t like to say that these approaches are pointless, but I have to admit that only small or underground galleries can afford to view their mission in this light. Public institutions whose activities generate substantial costs have a duty to serve the general public and be at their disposal. This is why my first loud and clear message to the MOCAK team when I became the director was that we had to find every possible way to help our audiences enjoy their interaction with art to the fullest. One new rule we have implemented is that every work that we present to an audience has to be accompanied by a description and a clear explanation. Some intellectual snobs have claimed that this is childish and naive, but the majority of our visitors are grateful for our efforts. We aim to explain to the general public how useful art can be as a tool and how much we need it in our life. We show our audience that art enables them to expand their horizons, formulate well-founded opinions, avoid falling victim to manipulation and criticise constructively the surrounding reality. Art allows everyone to feel free under all circumstances, as it teaches us how to confront established conventions. Every single person can enjoy all these fantastic things if they are brave enough to interact with contemporary art. All you need is a willingness, but, unfortunately, a conservative audience needs a great deal of encouragement to take a step into the unknown. This is where we come into the picture. We have to choose relevant themes and create engaging narratives to inspire our visitors and make them crave more. I have been working in the field of art for over four decades. During that entire period, I was building up my private collection and subsequently decided to donate it to MOCAK. I tried to open a museum of contemporary art in Krakow as early as the 1980s. I wrote countless letters to the city authorities trying to convince them that this project deserved their support. As soon as I had gained in-depth knowledge of culture, there was one thing that bothered me about Krakow – in the city you could see the Middle Ages, the Renaissance and the Baroque, but there was nothing related to the present. This made me even more determined to create an international contemporary art museum. Fortunately, these days the city is more open to new artistic influences and all the periods of art history are represented with due emphasis. I would never say that my contacts and interaction with artists are my “everyday routine”. There is nothing standardised about our collaboration, since each one is like a separate, exotic island. My probably most extreme adventure involved working with Milan Knížák. The year was 1987. We were working on an exhibition at the Potocka Gallery. As an artist from Czechoslovakia, in order to be able to present works at an exhibition abroad, Knížák needed to get permission from his country’s embassy. We were not about to to approach the embassy formally in this matter, and thus decided to make all the arrangements in virtual secrecy. Milan sent us from Prague a few parcels with his drawings, photos and designs. He was planning to use these materials for his collages and installations in Krakow, and this is why he arrived a little beforehand. I offered to put him up at my house, which was the common practice with artists invited to galleries by private persons. Three days passed and I noticed that the artist was becoming pale, listless and moody. He finally admitted that what he needed was a woman. He asked me to find him a prostitute for the night. We went to an exclusive hotel where he could comfortably enjoy his encounter. In the morning he was all happy, eager and willing to do his best to create new works of art. In total we have 65 members of staff at MOCAK. Each working day, I have a key meeting with the heads of the Collection Department and the Exhibition Department. We meet for lunch every day at the same hour. So, everyone knows that I am always busy at half-past twelve. We have a relatively well-equipped dining area at the museum, so we bring our own food and heat it up. It is healthier, cheaper and quicker than going to a restaurant. Our meetings are always work-related. We discuss all the current issues. I do not have such regular meetings with other museum staff, but every Monday I receive weekly reports from them. I familiarise myself with those reports and this becomes a trigger for discussion about selected issues. These reports and discussions keep me abreast of the topical matters at the museum. When we plan new events, I discuss them together with all the members of the various departments. Together with their authors I also go through the pieces written by museum staff. My team also helps me browse the documentation of artists whose exhibitions we want to present. Together we analyse the materials provided and think about how we could interpret specific works. Another element of my working day schedule is walking around the museum and checking on the greenery and outside installations. Every day, together with the deputy director we visit our museum exhibitions and point out anything, however small, that is not quite right. Having coffee with the legal team is also part of my daily ritual. I know that they really like to play it safe at all times, and it is often stimulating to find a challenge for them. We organise some 20 shows annually. MOCAK has two huge exhibition spaces. On the ground floor, we present temporary exhibitions and in the underground part of the museum we showcase our permanent collection. Besides that, we have three small galleries. In one of them, we display works by students. We invite professors from selected art schools, often from other countries, and they put forward works by their students that we could exhibit. From time to time I myself become a curator of monographic exhibitions. Recently I curated exhibitions of works by Jonasz Stern and Leon Chwistek. I am also a co-curator of the big “civilisation” exhibitions. These are our flagship projects. On each occasion we have a few dozen artists from all over the world working on such a show. These exhibitions also serve as an opportunity to put out new publications discussing in greater detail the primary theme of a given show, and not merely as works of art and means of artistic expression. These events aim to encourage our audience to conduct their own in-depth research on the presented topics. Everyone knows what history, sport, medicine, gender and homeland are. These notions seem so clear and unquestionable that we become inattentive to the various more complicated aspects that they entail. When we organise our exhibitions, we intend to draw the attention of our visitors to such obvious notions anew. Through exhibitions we also show the way in which artists see the world. They all clearly demonstrate the underlying principles of art. Art is about seeing things differently, trying to adopt a different perspective and not trusting anything that seems too obvious. For our flagship exhibitions, we try to identify important contemporary themes. Our first topic was history, since our museum opened up in a historic city and our premises are located in a historic building. Later on, we focused on sports because UEFA Euro 2012 came to dominate discussions in the media and society in general. Gender became our focus in the year when the right to enter into registered partnerships and civil unions was advocated and the proponents of such partnerships were defeated. Now we are celebrating the 100th anniversary of Polish independence. Therefore our watchword this year is “homeland”. I think that the next exhibition will be about politics because there are so many controversies related to the right-wing government and its approach to power and authority. I feel that we need to show how artists react to these tumultuous political events. Monographic exhibitions are usually aimed at expanding knowledge about a given artist whose works are included in our permanent collection. With such exhibitions we try to present their art from a broader perspective. We have already held many such exhibitions. We have presented works by Daniel Spoerri, Josef Dabernig, Julian Opie, Csaba Nemes, Władysław Hasior, Jonasz Stern, Piotr Lutyński and many others. At the museum we have also run a series of exhibitions featuring poets as artists – to date, Wisława Szymborska, Zbigniew Herbert and Joachim Ringelnatz. We have already decided that our next “guest writer” will be the famous novelist and poet Herta Müller. Exhibitions related to the Holocaust are another key element of our programme. The most important of these exhibitions was entitled The Experiencing of Auschwitz. This year we will exhibit pieces by Boris Lurie, who shows the horrors of the Holocaust using a pop art style. Next year our visitors will be able to see the collection from the Sachsenhausen camp. 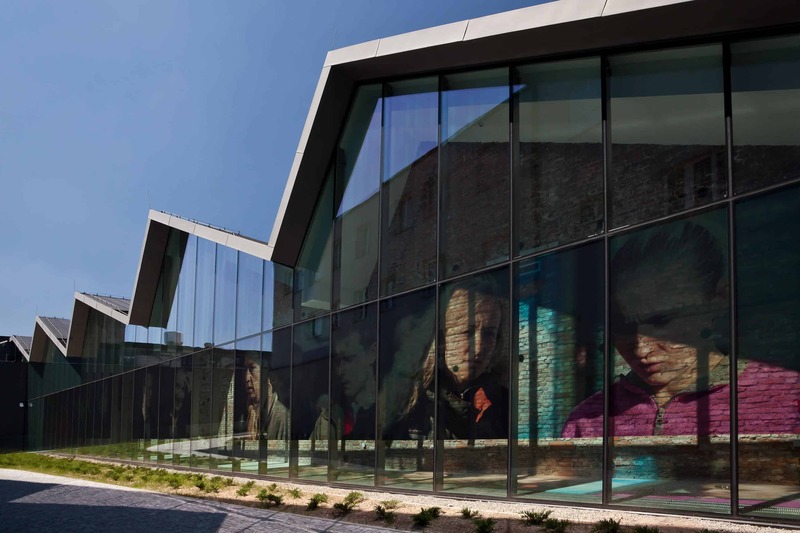 MOCAK Museum of Contemporary Art in Krakow,On the building, work by: Beat Streuli, photo: R.Sosin. There is also another kind of exhibition that we organise at our museum. I am talking about the presentation of pieces from our Collection. The Collection pieces are gathered so that we can present crucial issues of the contemporary world. We look for works the underlying concept of which reflects influential ideologies, but they also must be visually attractive or intriguing so as to appeal to our visitors. We also collect works which try to challenge the purpose of art in general. As a result we assemble building blocks that we later use to develop an extended narrative, both related to specific issues and directed at the mass media. We expand our collection continuously. I visit art fairs to look for pieces which we may want to acquire. Previously we had had generous funding from the Ministry of Culture for purchasing works of art. Unfortunately, we are not going to receive any financial support this year. So far I have not received any reply to my requests for a justification of this decision. Nevertheless, I am not going to give up and I will continue to question it. I can see no reason for the refusal to provide us with funding for our purchases. Our bid for funding was in no way inferior to those we submitted in the previous years. It thus appears that the grounds for the decision must have been political. If I do not receive an answer to my queries, I will consider taking legal action. As for now, I have stopped visiting art fairs to avoid spending the museum’s money on such trips. Whenever I do manage to have any funds to spare, I participate in auctions in Poland. This is where I also buy materials to be stored in our archives. Mieczysław Porębski’s Library, in the background: works by Jerzy Nowosielski, Tadeusz Brzozowski, Stanisław Ignacy Witkiewicz, Ryszard Winiarski, Tadeusz Kantor, Maria Jarema, Mieczysław Porębski, Kazimierz Mikulski, Jonasz Stern, MOCAK Collection, permanent exhibition of Mieczysław Porębski’s Library, photo: R. Sosin. International relations are crucial for museums such as MOCAK. We have participated in numerous projects which involved collaboration with museums, institutes or opera houses in other countries. An example of such a project was a massive exhibition of the MOCAK Collection held at the MAXXI. Usually, these are standalone events, which do not go on to be a long-lasting endeavour. 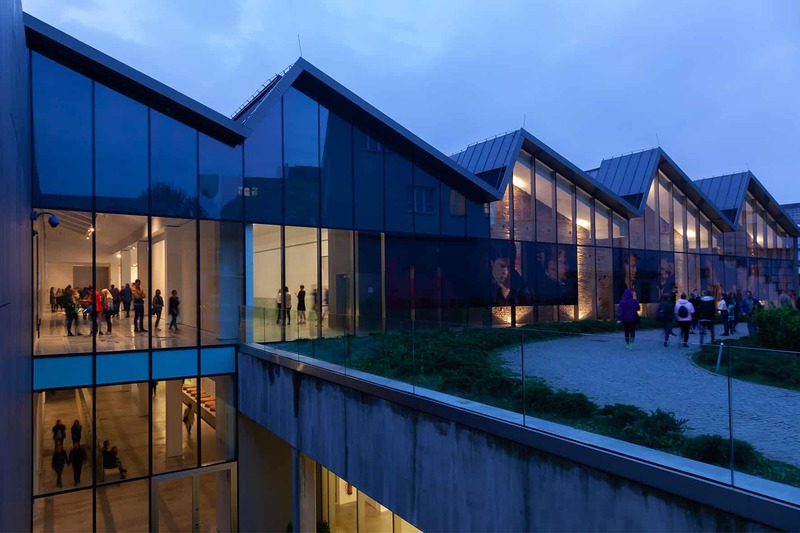 However, we work closely on a regular basis with two institutions abroad, namely the Kunstmuseum and the Center for Persecuted Arts (Zentrum für verfolgte Künste) in Solingen. This fruitful co-operation has developed due to the fact that our programme and the programmes of these two institutions are truly interconnected. We already organised a few exhibitions together, published several important pieces, produced one full-length feature film, organised panel discussions and conferences. We also have many plans for the future. We will soon be presenting the Herta Müller exhibition and exhibiting the collection from Sachsenhausen concentration camp. 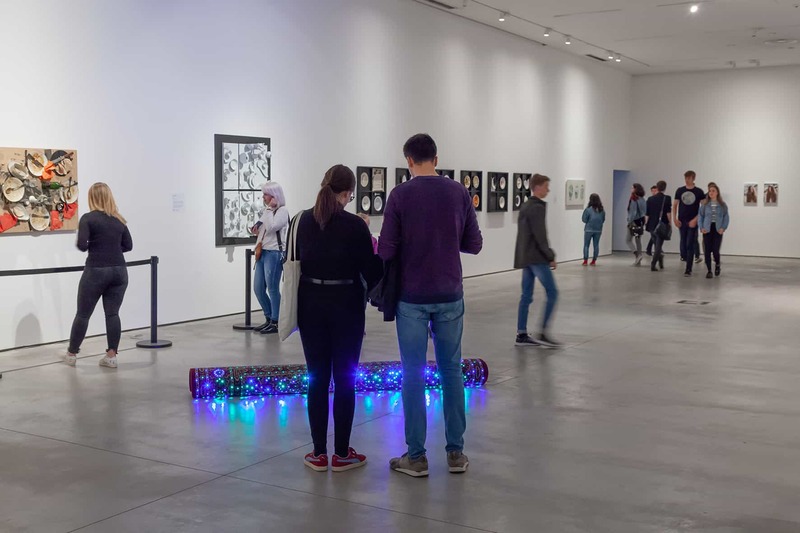 The majority of exhibitions organised at MOCAK are curated by our employees. Some shows are co-curated by curators from other institutions. Inviting guest curators is a risky business. Most such curators are just a drain on MOCAK’s resources. Therefore, I prefer to spare money to purchase new pieces for our Collection or to spend it on publications rather than pay guest curators. 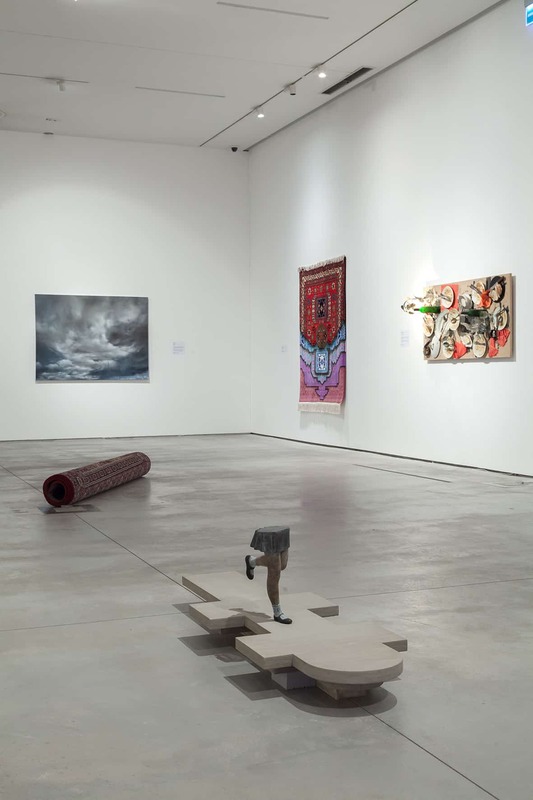 MOCAK Collection, from left, works by: Daniel Spoerri, Marek Kvetán, Zbigniew Warpechowski, Lee Seung-hee, Yigal Ozeri, photo: R.Sosin. The thing I enjoy most about my work is watching people who are genuinely happy while interacting with works of art and getting to know and understand them better. When you are around works of art on a daily basis, you never get bored or stuck in a rut. This is something I really appreciate. Every project seems to me like something entirely new. I am also really pleased when I see that my staff are achieving new goals and developing themselves on a professional and personal level. I make every possible effort to support them in this respect. In the beginning, quite a few of the museum’s workers proved unsuitable for the job. Fortunately, there is no longer much rotation in our team, and we are a group of devoted professionals. In the future, they will become prominent directors of art institutions, and will have the appropriate knowledge and instincts to allow them to quickly identify high-quality works. Everyone working at the museum tries to spread knowledge of it as much as possible. Here, social media are an important tool. The number of our followers on some social media channels is now incredible. Personally, I do not use social media, for many reasons. First of all, I find the language people use to interact on social media repulsive. I used to have a Facebook account, but I decided to delete it. Another thing is the voyeuristic nature of social media. They capitalise on the human tendency to snoop on other people. I think such lurking just takes too much of valuable time. I finish my work at home at about 8 pm. Obviously, in the meantime, I take breaks to work in my garden or cook something. But by eight I am finally free to watch movies and read books. Sometimes I finish projects a day early because I have to go to an exhibition opening or a reception the next evening. These outings are usually connected with my work for the museum. I love watching films in the evenings. I would say that I am somewhat addicted to them. One of my fiancés in the 1970s – a well-known video artist – promised me that when we built a house, he would arrange a small cinema for me in the basement. Now I carry this cinema with me everywhere, and this is my freedom. At home, I have an extensive collection of films and a Netflix account. However, I am disappointed that Netflix does not offer any masterpieces or films by the most eminent directors.